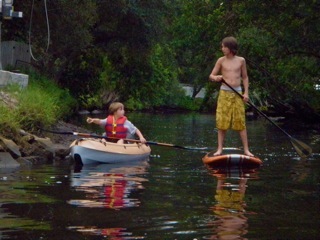 Southbound and Down…Paddle In Florida! We are on the road working our way to South Florida. After an overnight in Gainesville, we spent a couple of days with friends in Indian Rocks Beach, near St. Pete. We took two nice paddles along the canals and intracoastal waterway. On one of the trips we were treated to some play time with a couple of manatees! Speaking of play time, attached is a pic of Dylan and Tommy winding their way up the canal…and a shot of Tracey on her first YOLO ride! This entry was posted in Announcements on July 28, 2009 by Mike Sturdivant. the other day they want to let political movements into Santa Parade.But Salvation Army was against Civil Union Bill. The religion is strange but so if Christianity.